The UT Startup Job Fair from Longhorn Entrepreneurship Agency is Wednesday, March 21 from 10:30 a.m. – 2:30 p.m. More details are here: UT Startup Job Fair. 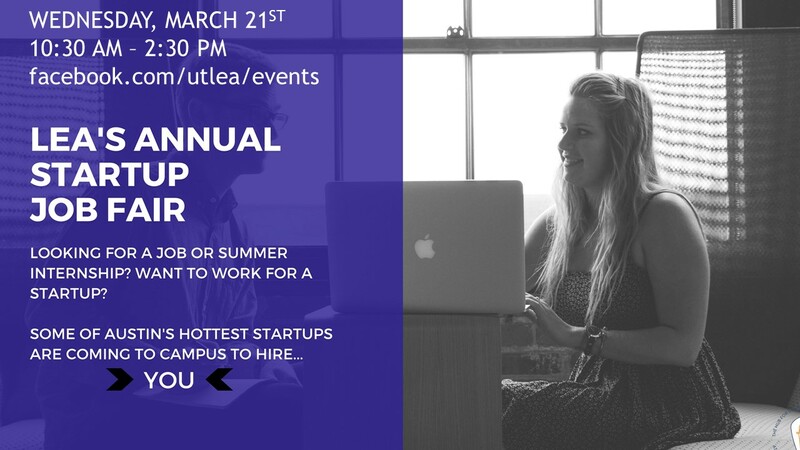 The Startup Job Fair is one of the best ways for UT students across all colleges and majors to have access to local startups and find opportunities for working in Austin’s award-winning startup ecosystem. They had 400 students come last year along with dozens of startups, including RideAustin, WeWork, and others! RSVP on Facebook via this link.